Last week I met up with poet friend Lynne to go to the Poetry Review launch at Keats House museum in Hampstead. I admit I’d not visited Keats House before (although I’ve been to the one in Rome), and I don’t think I’ve ever been to that part of Hampstead either. I grew up in South London and north of the river was (and still is in a way) a foreign country. As soon as you get off the train at Hampstead Heath it feels like you’re in a rather well-heeled and gorgeous place. Must be something to do with the street name plates being white-on-black, like in Oxford. Keats House apparently used to be two dwellings made to look from the outside like one. Young John was separated from Fanny Brawne merely by a load-bearing wall. The Poetry Review Launch was a warm affair and very sociable, Lynne and I even got snapped by the paparazzi. I met some lovely people, including Shanta Acharya, London poet Tessa Lang and recent Pighog Pamphlet winner Kate White, but didn’t really do any schmoozing. I almost introduced myself to Maurice Riordan, but then what would I have said to him? I actually don’t have a great track record of this sort of thing. Plus I’d had two three glasses of wine by this point and we all know what happens when things get a bit lairy. Highlight of the evening for me was hearing Sam Willetts read – more about him in a later blog post. Anyway, I was so delighted with the place I persuaded my husband that we had to have a day out to Hampstead and Highgate the very next week. As luck would have it, we chose Tuesday and it POURED with rain. 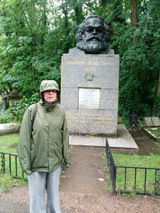 Here I am slightly less happy, in Highgate Cemetery. I’m feeling a bit how he looks. We took the guided tour of Highgate Cemetery West and learned about the Victorian fashion for draped vases, sleeping angels, Egyptian themed monuments and body snatching. There are 53,000 graves, mostly falling down as the undergrowth slowly reclaims it all. In the drizzle I can only liken it to being in a jungle, or perhaps Angkor Wat – but colder and quieter. People are still being buried at Highgate, but not as many as in its heyday (thirty a day wasn’t uncommon apparently.) One of its newest residents is Alexander Litvinenko, whose grave we were asked not to photograph. I’d like to go back to the Cemetery on a drier day. Not sure if anyone offers writing workshops there but it fired up all sorts of weird ideas in me. Last but not least – did you know Hampstead has its very own Flatiron Building? I really enjoyed this post! I love your near-misses with celebrity poetry magazine editors and ……. a work shop in a cemetery… mmm, might have to think about how to market that one… You’re very modest not mentioning it but I assume you read your Hamish Canham Prize winning poem at the PR launch? Lovely photographs, by the way, even the rain-drenched one! Thanks Josephine! 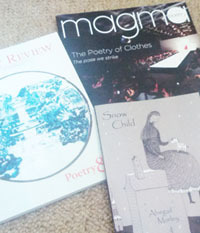 But no modesty involved, I can assure you – it was simply a launch event for the latest Poetry Review, no connection with the H-C. I was most definitely a lowly audience member!